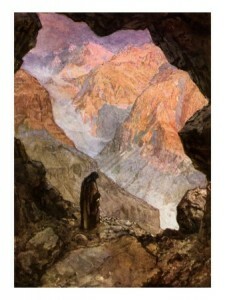 Here are some worship resources inspired by Elijah’s encounter with God at Mount Sinai. enable us to be still and know that You are God. breathe in us Your Holy Spirit to strengthen, comfort, and guide us in the midst of the storm. in our homes, in our communities, in our world. We pray all this in the name of the One who calmed the raging sea. Amen. ~ posted on My Redeemer Lives website. of our doubts and questions. and put our minds at ease. We come seeking God in mighty earthquakes. We come listening for God in resounding thunder. We come expecting God in sweeping victories. Yet God is found in a baby's touch. Yet God speaks in silence. Yet God is found in the least of these. Save us, O God, from our aimless wandering. Save us, O God, from our idols. Save us, O God, from our self-induced chaos. "You are my Beloved. I love you." ~ written by Katherine Hawker (1995), and posted on Liturgies Outside. it is enough, for us, that God comes in a soft, summer shower. it is enough, for us, that God opens up the fountains of faith for us. it is enough, for us, that God wraps us in the silence of grace. Go now, proclaiming to all how much Jesus has done for you. Be as one with each other in Christ. even in the sounds of sheer silence. to sustain you day and night. ~ Copyright © 2001 Nathan Nettleton. feel Your touch of pow’r. ~ David J. Evans. Copyright © 1986 Thankyou Music (Admin. by EMI Christian Music Publishing). CCLI Song # 120824. If you use this song in worship, be sure to report it on your CCLI license. ~ Vicky Beeching. Copyright © 2010 Thankyou Music (PRS) (adm. worldwide at EMICMGPublishing.com excluding Europe which is adm. by kingswaysongs.com) / Integrity Worship Music (ASCAP). CCLI Song #5670664. If you use this song in worship, be sure to report it on your CCLI license.